Frederick Hines was an artist in the 19th Century. He lived in Essex and London and was the eldest son of John Hines, a tinplate worker. John and his wife, Eliza, had three other children including Theodore Hines, who was also an artist working in a similar style to that of his brother. Frederick married Agnes in 1898 and they had two daughters, Olive and Mavis. Frederick Hines was a member of the Royal Academy, frequently painting watercolours of figures, animals and rural scenes, which he portrayed in a romantic and sensitive style. He exhibited regularly at the Royal Academy and leading London galleries and sold numerous works, often signing his watercolours 'Fred Hines'. He also illustrated many works, including one edition of Goldsmith's 'The Deserted Village', along with Ernest Wilson. Some of his illustrations, small vignettes of landscapes, were used as Christmas cards and were described as 'exquisite' in an article in the London Standard of 17 December 1885. During the artist's lifetime watercolour painting had a surge in popularity; watercolour sets were portable and therefore more easily transportable to different venues. This painting is of the New Forest, Hampshire. 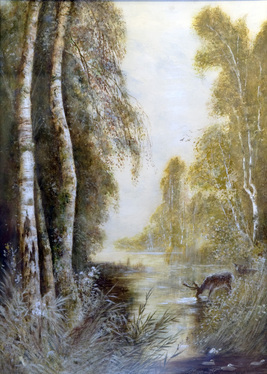 The portrait composition focuses your eye to the foreground where a stag and deer are drinking from the water. The tranquil setting is enhanced by the colour and style of the painting, giving the water a calm glass-like quality. This was fairly typical of Frederick Hine's work.